Solid-sided maintenance series SCHO70, SCHO91. Manufactured LLC "Belgorod plant" Energotechmontaght "in accordance with TU 3434-001-95641262-2006. 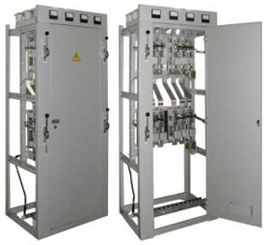 Nomenclature panel allows you to collect from ready элементовраспределительные devices 0.4 kV with a variety of schemes and layouts. By appointment panels are divided into linear, introductory, section, water-line, panel sapparaturoy ATS panel supervisory control of street lighting. Panel production by LLC "Belgorod plant" Energotechmontaght "soglasnooprosnyh sheets and in accordance with the schemes of the main circuit.